After our amazing meal at The Kitchin on our last visit to Edinburgh I knew already that we would have to repeat the experience. 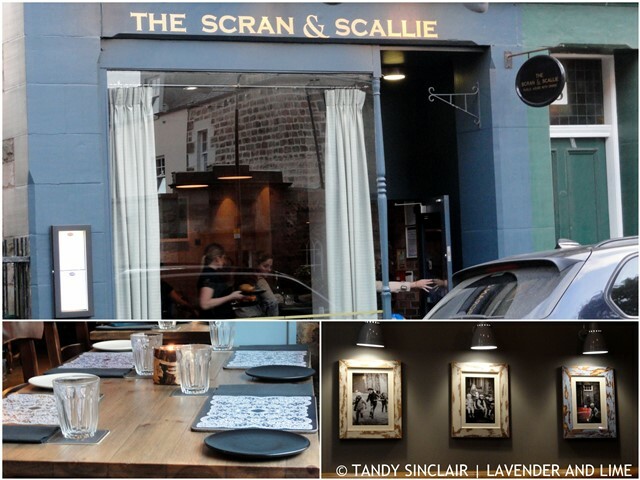 But as we were travelling with Mark, who is a meat and potatoes kind of guy, I made a reservation at The Scran & Scallie instead. Tom wanted to create a place where families could come to enjoy a meal, with their children. And on the night we were there, one of the ‘children’ was the most adorable Boxer. Mark had confused our hotel reservation with the restaurant’s address in Stockbridge and he arrived there at 12pm looking for a room! The staff were most helpful in directing him to the hotel – a mile away, and welcomed us back with tales of his experience when we arrived for dinner. This gastro-pub has a lovely, separate pub area and we sat at the bar for our first round of drinks. With a great choice of single malts and beers on tap, the decision was not easily made. So we each decided to have something different and our selection included a pint of Edinburgh Gold for Mark, a pint of Bitter and Twisted for Dave and a bottle of Yer Ben for me. This is Tom’s signature ale which is made at the Isle of Skye Brewery. It was launched only a few days before our visit and is exceptionally smooth. Our drinks were served with a few bar snacks of pigs ears and scratchings. Our second round of drinks was a pint of Banyan for Mark and a pint of the Williams Draught for Dave. 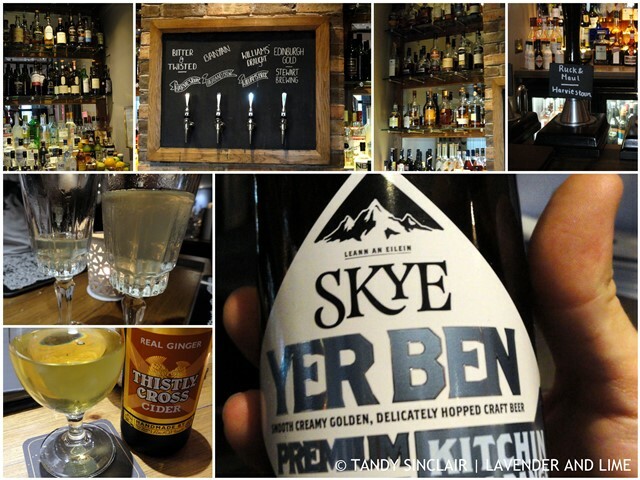 I had the Thistly Cross Ginger which is the first alcoholic ginger drink I have tried, and won’t be the last. We then moved into the dining room which has a scallie corner for children to play and sleep in. We were given the menu to peruse which is written with wonderful Scottish accents and includes bits ‘n’ bobs and scallie’s scran (children’s meals). The average price for a main course is £15.70 and from yer mains Mark chose the Scran & Scallie burger and chips (£14 & 00p) which he had served without any garnish and devoured. Dave had the fish and chips which was served with chunky tartare sauce (£14 & 50p) and is marked on the menu as being gluten free. 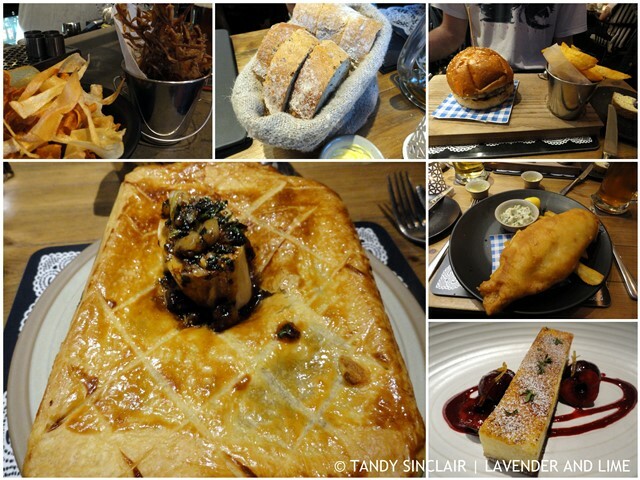 I had the Scran & Scallie steak pie (£16 & 50p) which had a marrow bone as the vent – what a great idea. The meal was excellent and we decided not to go for any of the specials which were offered to us. I was the only one to choose a pudding and each dish has a swally suggestion. I chose the vanilla cheesecake as it was served with Scottish cherries (£5 & 75p). I decided not to accompany it with the suggested Cardhu 12 year old but I have filed away the whisky name for future testing. I have listed the prices here as they are typed on the menu as I really loved how that was done. Our meal excluding gratuity came to £80. Ewelina looked after us and we received great service from her, as well as all the other staff members we dealt with. Nothing was too difficult for them, and when we asked for a copy of the menu, each of the three pages were individually rolled and tied for me to take home. As with The Kitchin, the food philosophy is From Nature To Plate. You will be guaranteed a seasonal meal when you dine here and therefore the menu will change often. The menu itself is inspired by traditional 18th Century Scottish meals. That pie looks exquisite. 🙂 Now I’m craving one. Ooh, lovely, proper, hearty pub food! Sounds fab, Tandy. Must admit though, Edinburgh was one of my least favourite places, for a whole host of reasons. Perhaps next time we visit there, if we do, we should dine here? Sounds like a wonderful place Tandy, the food sounds amazing! This sounds like a great place. I need to go to Scotland soon so I’ll have to remember this! £80 sounds very pricey but I guess you pay for a delicious menu and good service. The menu looks delicious too. So good to hear you had a good time!